Abstract: As life tempo is getting faster, more and more people are seeking efficient transport vehicles. Faced with the heavy traffic, the so-called fast vehicles, like buses and cars could no longer move “fast”. Airwheel R3 Electric Assist Bike was born following the tide that allow riders to refuse traffic congestion. In the modern society, the traditional buses and cars could no longer meet people's needs. The traditional vehicles give way to the emerging and efficient ones, like intelligent electric scooter and smart e bikes. For people with different occupations, they could customize their unique way of commuting with an Airwheel R3 smart e bike. As the Airwheel brand keeps going, there is a complete set of products with distinctive features. R-series is the newest series featuring three ride mode. R5 is the first model of R series and one the basis of R5, R3 electric moped bike was born. Riders are empowered to alter riding styles of man-powered, power-assisted and electricity styles freely. 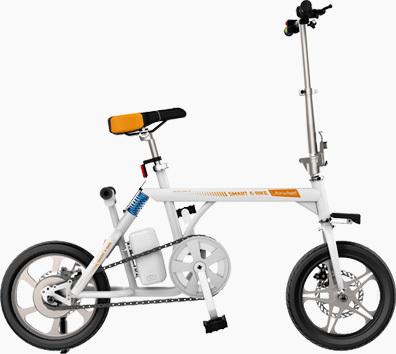 Riders can enjoy different riding pleasure in different modes, for instance, in man-powered mode, it can behave like traditional bikes to build up your body; you can achieve a longer range on a single charge in power-assisted mode; the 235w motor will give you an easy ride in electricity mode. Also, R3 can be folded into a manageable size for riders to carry or store it. The battery of Airwheel R3 portable electric bike is swappable located below of the saddle. That is, riders can easily disassemble and replace the battery as well as facilitate the charging process. Moreover, the UBS port mounted on the battery makes it more useful, as it is compatible with the daily electronics. Unlike R5, Airwheel R3 is equipped with a 14-inch wheel hub enabling R3 to be adaptable to various road conditions, as the 14-inch tire with unique tread pattern that helps drain water, dissipate heat and enhance grip performance ensures a comfortable riding experience. also, there is a 3M reflect light that is exclusively designed for night riding, making riding safer and more energy-saving and greener. In a word, the invention of Airwheel R3 electric aided-bicycle is a revolutionary breakthrough in the development of the industry, making people's daily life healthy and pleasurable.